Find hotel near Sri Maha Prathyangira Dev ..
What could be another reason for a temple visit, other than some tranquil escapade? Some visual serenity! Hence, the Sri Maha Prathyangira Devi with its location adjacent to the Bay of Bengal is a must-visit attraction of Chennai. Perched picturesquely on the banks of the Buckingham Canal this temple is dedicated to Goddess Prathyangira. The goddess is believed to ward off the bad influences, those of witch craft especially. On Sundays and festivals special poojas are held here, along with the regular Abishegam and Archana. Special poojas offerings held on every Sundays. How popular is Sri Maha Prathyangira Devi? People normally club together Madhya Kailash Temple and Dhenupureeswarar Temple while planning their visit to Sri Maha Prathyangira Devi. An awesome temple where you can the feel of Kerala style outlook. Ample space for parking and lot of stores to purchase. 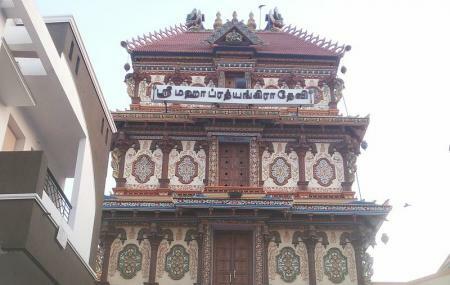 Still construction is going on but very rare kind of temple found in Chennai. Calm and peaceful place. You feel the whole new experience in this temple. The temple is amidst of residential area. I trust it belongs to private trust. The temple has vast area and all god's idols. Some of the names I am hearing for the first time. The temple is built on Kerala style. Good place to visit. Nice temple to see all the god and goddess in one place.. Located just near to the main road. All the status here are differently sculptured. We have a bigger size goddess called Kali and also the fire god status were found here which I have never seen in any other place... That was the wondered one where it has three legs five hands and two-face. It has to be visited atleat once to see that god of fire..
One of the most powerful gods..Nice and very spacious temple with car parking... construction is very good.. Here you will see the idols you have never seen before. 3 legged Agni, Boar headed goddess and many more.